Array of Activities in the month of August 2017. GLBIMR nurtures the aspiring managers, making them corporate ready and career oriented. Achieving academic excellence, integrated with skill enhancement is the core focus of our Institute. 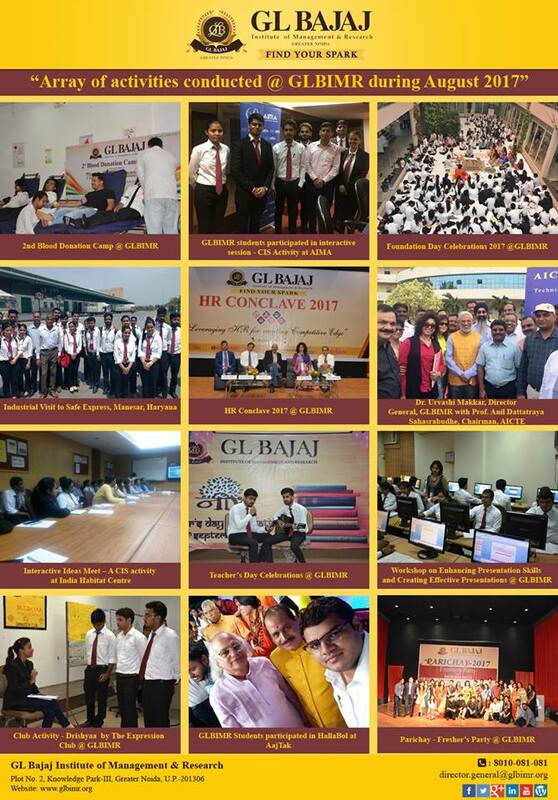 Under the leadership of Dr. Urvashi Makkar, Director General GLBIMR; multiple activities were organized during the month of August 2017, to provide comprehensive augmentation and corporate exposure to its students and faculty. 2nd Blood Donation Camp was organized to mark the spirit of donating life, 11th Foundation Day of GLBIMR was celebrated with great enthusiasm, energy and zeal, PGDM Batch 2016-18 welcomed the new Batch of 2017-19 with a grand Fresher’s Party- “PARICHAY-2017”, GLBIMR successfully organized "HR Conclave 2017 - Leveraging HR for creating Competitive Edge", where more than 200 delegates participated, In-house workshop on enhancing presentation skills was also organized for the students. To add to the glory of laurels, Dr. Urvashi Makkar, Director General, GLBIMR was invited to participate in the UK-India Education & Research Initiative (UKIERI)'s "Technical Leadership Program", by AICTE. Club activity – Drishyaa was also organized in August month. Under the Corporate Interface Series, GLBIMR students participated in a session at AIMA and AajTak while for industrial visit; PGDM students visited the Safexpress Logistics Park, Manesar, Haryana. The month was packed with various activities, achievements and celebrations. Here is a glimpse of the activities.